Facebook Has Made New Algorithm Updates: Spammy Social Marketers Beware! You might notice that this equation doesn’t include Negative Feedback which is another important aspect of the algorithm. The recent updates were actually developed by monitoring what triggers a Negative Feedback action and appear to be a step in the right direction when it comes to user experience. Here are the updates Facebook has made to stick it to spammy social marketers. If you are in the habit of just reposting what you have seen work for other pages on Facebook, stop what you are doing. 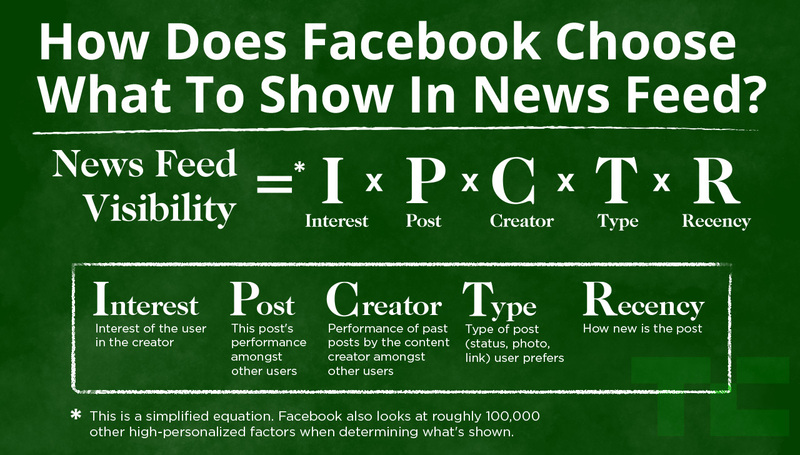 The News Feed has been optimized to de-emphasize pages that publish content that has already been uploaded to Facebook over and over again. Early testing of this update has shown that people hide 10% fewer stories overall. Many marketers switched from content creating to content curating last year, however it looks like it’s time to think about switching back. With the explosion of publishing on Facebook came the rise of super spammy links. You know exactly which ones I am talking about. Spammy links feature misleading titles that prompt users to visit websites that promise awesome things like cute baby animals but then serve a website riddled with ads. By measuring how frequently users engage with the original post containing that link, Facebook is now able to better detect these spammy links. Early testing of this update has shown a 5% increase in people clicking on links that take them off of Facebook. This demonstrates that people are seeing more relevant and valuable content in their News Feeds. Be sure that your messaging about a link is accurate and engaging enough to get people to leave feedback. Like-baiting is pretty straight forward and we have all seen these posts. Any post that explicitly asks users to Like, Comment or Share the post in order to get further distribution is considered like-bait. It used to be social media best practice to include a call to action in each post. Well, it might be time to take a different approach. Facebook has made a change to better detect these posts and make sure that they aren’t shown more prominently over content from users’ friends or highly relevant pages. Facebook says that this update won’t impact pages that are genuinely trying to encourage discussion, only those pages that repeatedly ask for engagement. I would suggest that you don’t need to abandon this approach altogether, however few and far between might be the best bet. So what have we learned? People don’t like spam in their News Feeds and neither does Facebook. These slight updates to the algorithm should hopefully make big impacts when it comes to user experience. How can you ensure that your Facebook content strategy isn’t considered spammy? Do your best to start creating fresh content. Even if you see something that is working for another brand, try to recreate it with your own spin. As marketers we have to begin creating new stories and not just retelling old ones. I would recommend starting with a blog. Make sure that the text and titles that accompany the links you publish are accurate. Bait and switch will no longer be effective. Continue to encourage people to engage with your content, however do so with restraint. Great content doesn’t always need a call to action. People know what to do at this point.